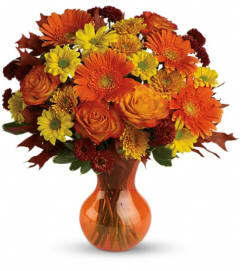 Your guests will be impressed with this attractive centerpiece -bright orange asiatic lilies, orange alstroemeria, red daisy spray chrysanthemums and yellow button spray chrysanthemums are accented by millet, eucalyptus and oregonia. 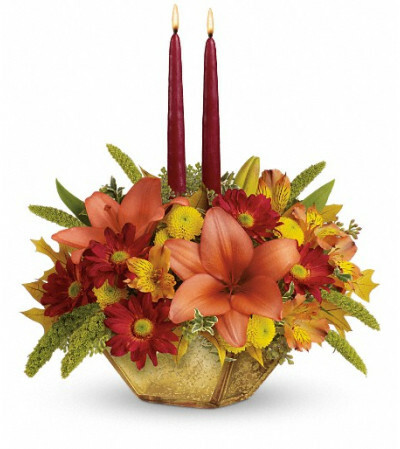 Nestled inside the lovely Harvest Gold Bowl, it's as grand as Thanksgiving dinner! 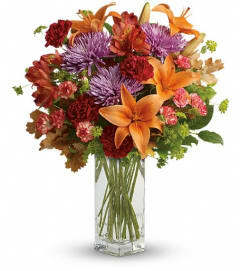 Bright orange asiatic lilies, orange alstroemeria, bold red daisy spray chrysanthemums and yellow button spray chrysanthemums are accented by millet, eucalyptus and oregonia - it's a beautiful spread! Delivered in a gold mercury glass bowl.